The new BMW X5 is larger than its predecessor which was launched some years ago now. The new model has some subtle changes in its design but BMW has not strayed far from the old model’s looks. 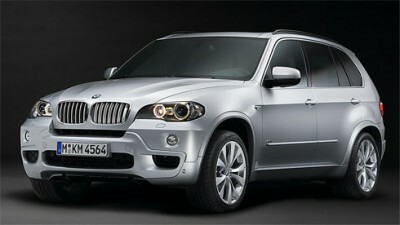 And this is not a bad thing, as the commanding presence of the old model is still present in the new look BMW X5. Both longer and wider, the new BMW X5 has an extra row of seats right in the far back. Perhaps not seats that you could save for adult to sit in, but, certainly comfortable enough for the kids. The middle row of seats is spacious and can comfortably seat three tall adults. As one would expect, the large 4×4 has a large boot and is capable of carrying large amounts of gear for those weekend getaways with the family. With the seats up, the luggage space is still a handy 620 litres. Upholstery can be either in leather trim or cloth depending on one’s tastes. I would assume, though, that for a car of this pricing, most buyers will opt for the neatly crafted leather seats. And why not? They are simply superb. Off-road, the BMW offers surefooted handling and is more than capable of handling slippery and different terrain. The electronic hill descent aid is great for those steeper slopes that require that extra bit of care in descent. The BMW X5 is certainly no bunny if you care to take the machine into more demanding territory. The suspension set up is impressive for on-road travelling. The BMW X5 covers the tarmac with lots of pace and it has a nimbleness that very few 4x4s can match. This is quite a feat when the BMW X5 weighs in at around 2.25 tonnes. I’ve heard it said that the 4.8i BMW X5 has completed the Nürburgring track in 10 minutes. As a buyer, you will plenty of X5 models to choose from. Six impressive BMW X5 variants grace BMW Australia’s showroom floors, where you will find a choice of four motors to power your machine. The range topping BMW X5 4.8i has a V8 engine mounted longitudinally in front. The engine produces a thumping 261 kW at 6300 rpm and yet boasts a combined economy figure of 22 mpg. With loads of grunt, the 2.25 ton BMW X5 V8 will stonk up to 100 km/h in a mere 6.5 seconds and will gallop to a top speed of around 240 km/h. On the other hand, if you think a diesel motor is a better option, then you will find that the class leading 3.0 Litre 6-cylinder is a gem. The smooth diesel is available in two power ratings. The 3.0d is an exceptionally torquey motor that is sublime to drive even when having to pull a heavily laden X5. You will find the 160 kW at 4000 rpm more than enough to play with – not to mentioin the colossal 500 Nm of torque from an unbelievable 1750 rpm! If you still require more horses under the bonnet, then the BMW X5 3.0 sd boasts 565 Nm and 200 kW. A 230 km/h top speed is all in a days work in this sublime 4X4. The awesome torque levels in the BMW diesel engines are, of course, a very handy asset to have in off-road conditions. All the X-fives are run via a smooth 6-speed gear box, and the silky operation means that pleasant progress can be made in all terrain and the BMW X5 cabin will remain quiet and refined. This adds up to an altogether very pleasant experience for both the driver and passengers. Lastly, you may consider the 3.0si petrol engine to be your favourite X5 motor, and that woudn’t surprise me. The six cylinder drive train is the cheapest X5, but still remains a top drive. There is plenty of smooth power to be had, and of course you still get the beaut BMW X5 on-road chassis which will embarass many so-called sporty sedans on a tight and twisty back road. Equipment levels are lavish in all models. All the familiar electrics are part and parcel of the BMW X5 vehicle. Some of the items available as standard in both forms of the BMW X5 are: ABS (anti lock brakes), ESP (electronic stability), dynamic stability control, driver and passenger airbags, central locking, alarm, air conditioning, electric windows, sunroof, cruise control, premium sound system, and satellite navigation. Whether the BMW X5 is used for exploring the dirt route or taking the kids to school in town, the BMW X5 will take these practices in its stride-not to mention in class, safety and comfort. For any more information on the BMW X5, or for that matter any other new car, contact one of our friendly consultants on 1300 303 181. If you’d like some fleet discount pricing (yes even for private buyers! ), we can submit vehicle quotes requests out to our national network of BMW dealers and come back with pricing within 24 hours. Private Fleet – car buying made easy!